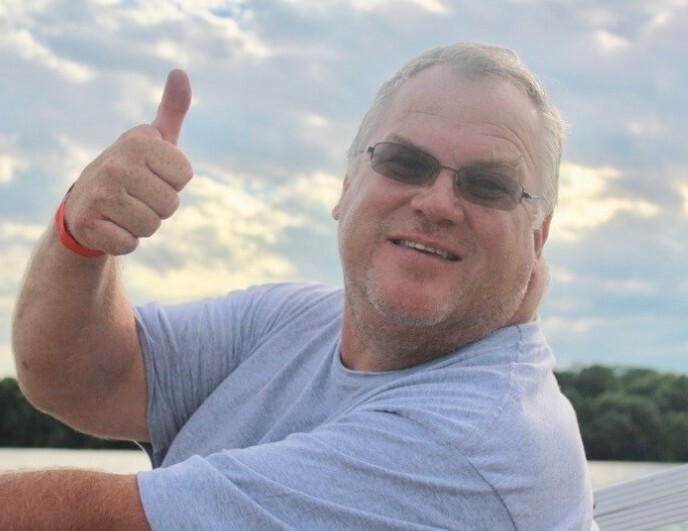 Kevin C. Fischer, age 56 of Sauk Centre, died March 19, 2019 surrounded by his family in Belgrade Nursing Home in Belgrade, Minnesota. A Celebration of Kevin’s Life will be held at 11 a.m. Saturday, March 23rd at First Lutheran Church in Sauk Centre with Rev. Ruth Gangloff officiating. Visitation will be held from 4 to 8 p.m. Friday at the Patton-Schad Funeral Home in Sauk Centre with a Prayer Service and Sharing Time beginning at 7:30 p.m. Visitation will continue Saturday morning from 10-11 a.m. at First Lutheran Church. Kevin Carl Fischer was born July 29, 1962 in Fosston, Minnesota, the son of Clifford and Alice (Bloomgren) Fischer. Kevin attended school in Gonvick, MN and was a proud “Bulldog”, graduating with the class of 1980. It was also in Gonvick that he followed in the footsteps of his dad and began his 40 year career in the concrete industry where he was known simply as “Fish”. On September 26, 1992, Kevin was united in marriage to Wanda (Cook) Fischer at the Samhold Lutheran Church in Gonvick, Minnesota. Together Kevin and Wanda raised three sons, Samuel (age 24), Joshua (age 20) and Jackson (age 16). After living in the Twin Cities for several years, Kevin, Wanda and their boys moved to Sauk Centre, Minnesota in 2004. During this time, Kevin worked in sales and sales management within the industry he loved so much, most notably for Lehigh, Cemstone, and most recently for AVR/AME. He had a tremendous ability to build close relationships and considered many friends in the industry his family. More than anything, Kevin loved spending time with his family including coaching and watching his son’s sports teams, cooking for his boy’s friends, boating, hot tubs, and yelling at the TV watching Vikings games. He was so proud watching his kids pursue and achieve their dreams. Kevin also enjoyed visiting up north and spending time at Ebro, the family hunting land, where he was camp cook. He was the ultimate entertainer and loved to grill and cook too much food for family and friends. Kevin’s faith was deeply important to him and he treasured his “church family” from the United Methodist Church in Sauk Centre, Minnesota. He passed away on March 19, 2019 at the Belgrade Nursing Home at the age of 56 years, 7 months and 18 days. Kevin is survived by his wife of 26 years, Wanda; sons Sam (significant other, Kaitlyn Bicek), Josh and Jackson; brothers Jim (Phyllis Hagen) Fischer of Crookston, MN and Rick (Barbara) Fischer of Sauk Centre, MN; sisters Conne Syverson of Trail, MN, Corky Syverson of McIntosh, MN, Janet Brenteson of Mound, MN, and Mary Olson of Trail, MN; brother-in-law LeRoy Johnson of Winger, MN; father and mother-in-law Ralph and Barbara Cook of Glenwood, MN, brothers-and sister-in-law Brian and Tamie Bremseth of Madison, MN, and Vince (significant other, Jess Wilson) Cook of Brainerd, MN; Godchildren Joe Fischer, Derek Bremseth, and Megan Sveen; and numerous nieces, nephews, relatives and friends. Kevin was preceded in death by his parents, grandparents, Carl and Ethel Dahlquist, sister Nancy Johnson, and brothers-in-law Arnold Syverson, Karsten Syverson, and Bob Olson. In lieu of flowers, memorials preferred to Adult & Teen Challenge in Kevin's honor.